In 1275, Yuan soldiers attacked the temple where Mugaku Sogen stayed. As the attack progressed, the priests present at the temple fled to safety. Sogen, however, chose to stay behind. According to legend, Sogen sat quietly on the floor in front of the temples main Buddha statue. As one of the Yuan soldiers unsheathed his sword to kill Sogen, Sogen recited a Buddhist precept. "I did a comprehensive study to seek the real universe, and finally got the answer. That is to say, all is vanity. People are vanity, and even Buddha’s teachings are vanity. Now, I am spiritually awakened, and so, even if you want to kill me with your huge sword, I don’t mind. I already know that I am vanity. This means when you swing your sword, you will just cut through a spring wind." The soldier could not bring himself to kill Sogen, and expressed his respect for him, then turned and left Sogen in peace. Mugaku Sogen was born in 1226 in south Song (during the Song dynasty; 1127–1279) and became a priest at age 11. He entered the priesthood at Ching-tz'u-ssu temple when he was just 13 years old, and soon afterward, in 1239, he visited Wu-chun Shih-fan, under whom he studied the Zen teachings. In order to further his studies of Zen, he met with many different teachers. 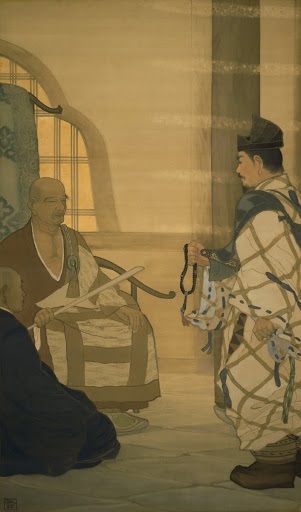 In 1279, he was invited to spread Zen in Japan by Hojo Tokimune, the eighth regent of the Kakamura Shogunate. Once in Japan, he lived at Kenchō-ji temple in Kamakura with Tokimune’s support. In 1282, when Hōjō Tokimune built Engaku-ji temple in Kamakura, he invited Sogen to be the founding priest. Two years later, Sogen returned to Kenchō-ji temple where he died. He exerted great spiritual influence on the leaders and warriors of Kamakura.